As you enter the gates, you can't help but feel excited as you see the train tracks. 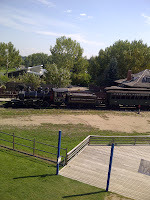 Hearing the whistle as the train rolls in brings many a squeal to patiently awaiting kids. 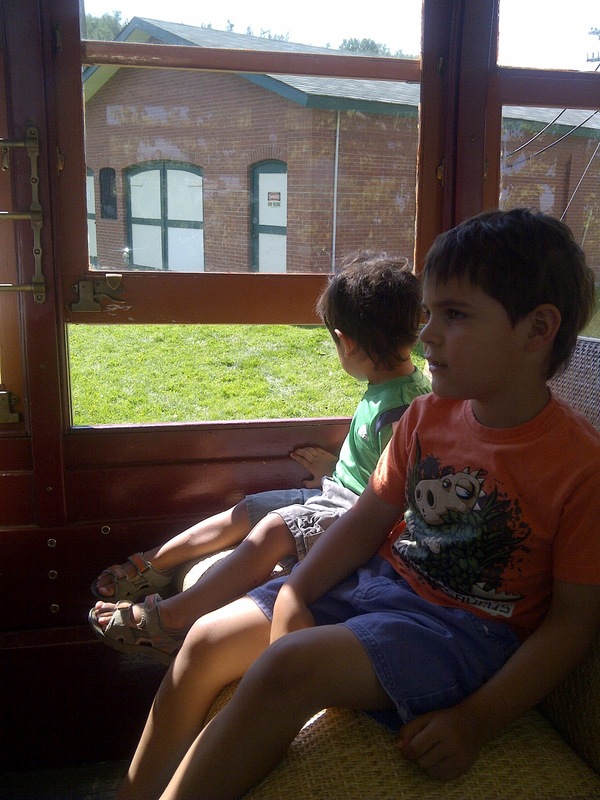 The train ride is a short one which will take you from the Train Station to the Hudson's Bay Fort. You can take the a stroller on the train but it needs to be folded and stored in the first compartment of the train. There are no seats in the first compartment so if you are lucky to get on early, you can put your stroller in the first cart and look for a seat in the second cart. 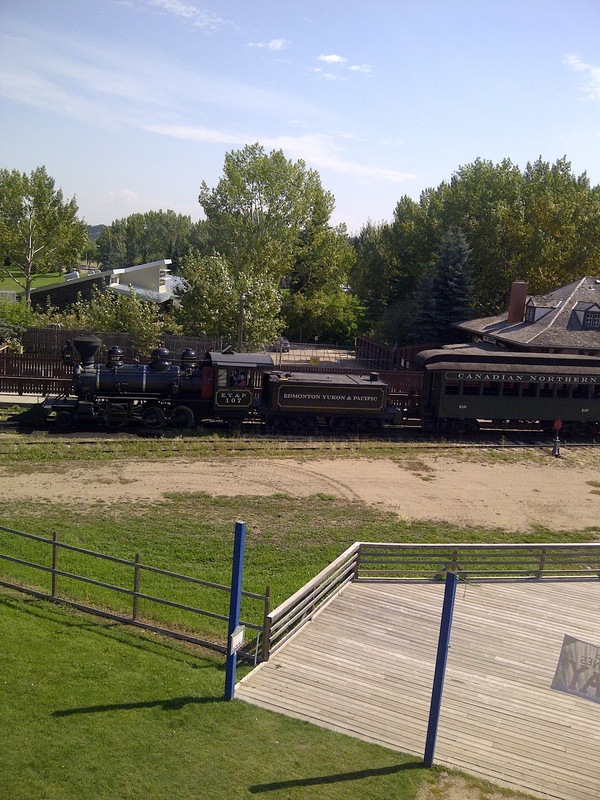 If the train is too full, we've visited the other attractions and then taken the train from the Fort back to the Train Station. The Fort is pretty amazing but the kids didn't want to see the bunkers or the house. They were more interested in the large boat and the sheep . Right outside the Fort, there is a small hill to the boat dock on the Saskatchewan River. Also throughout the park there are costumed individuals that will explain their "life" on the Fort. We love visiting the Teepee and hearing about the native Canadians and their lives. Sometimes they have yummy Bannock for a treat. 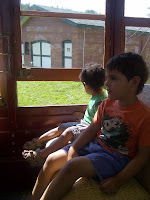 My kids love the Streetcar. 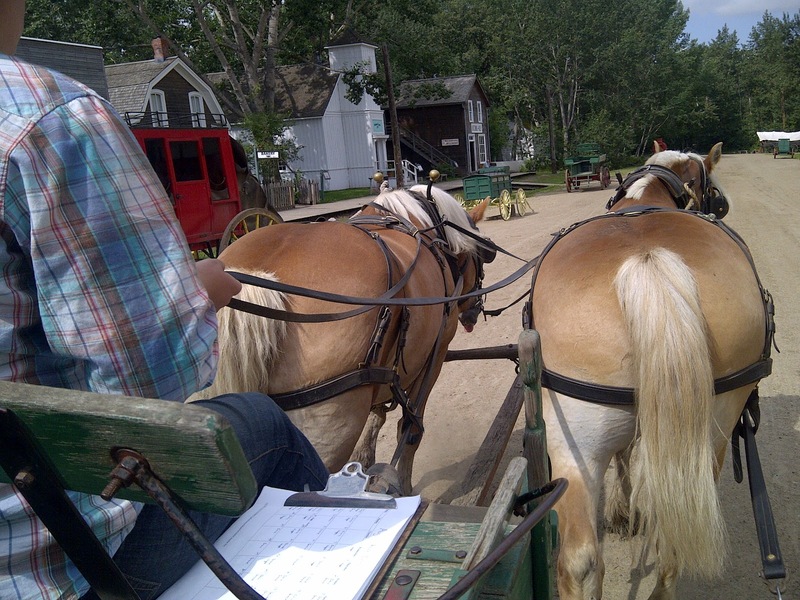 They will sit quietly while the operator picks and drops off people to the various points in the park. I am always surprised of all the things I've learnt about the street cars. Every operator tells a different story. The only draw back is that you can't bring strollers (even if they are folded) onto the cars. This means that I have left the stroller and taken the round trip to retrieve said stroller. You do have to buy tickets for this ride. You can buy tickets in different shops around the park. Two beautiful horses pull a wagon along the dirt lined road. The ride itself is not very long but it is a bit bumpy so it is just long enough to be enjoyable. Horses, chickens, pigs, ponies, turkeys, sheep are some of the animals living at the Fort. These are not petting zoo animals and have been known to run free of their pens. Well just the chickens that we've seen, so be aware at all times. I wanted to go to this since it opened but I was nervous taking both kids with me alone. One day my hubby tagged along so we decided to go in for the movie. We were in for a shock. It is a state of the art movie theatre with a nostalgic theme. The movie we saw was about Edmonton complete with special effects. I thought that my 2 year old was going to running around but once the movie started he was enthralled by the movie. The best part is that it is free with admission. I must admit I have bypassed this stop a few times because the treats are so good. I could spend all my money here. Needless to say, the kids get a sugar rush after eating one of its many treats. They are so good. If you need to rest for a bit, let the kids run in the playground. The swings, slides and see-saws are definitely a blast from the past, but the kids don't care. There is a picnic area and washrooms. It is well used by the school groups that frequent the park . You can definitely spend a whole day at the park. There is food available for purchase around the park as well as various picnic sites. I have done the latter so my spending money is on tickets for the rides. 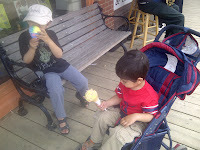 We've been to the post office, Motordome and Fire Hall just to name a few that the kids love to see. The interpreters that are around are definitely in character at all times. They do such a good job that you will find yourself drawn back in time without even realizing it. The Midway is by far the newest of all the attractions. With that being said, we save it for the last as the kids love this the most. They have a carousel ride with beautiful hand-painted horses, mini carnival games like tin pan alley and bowling for the little ones. There is a Ferris wheel for the brave at heart and mini rides for kids. Some are rides are free but others will cost you 1 to 2 tickets. I hope you get a chance to come to the park with your kids. 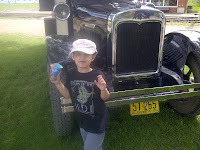 It is a great history lesson as well as fun time to be had by all. 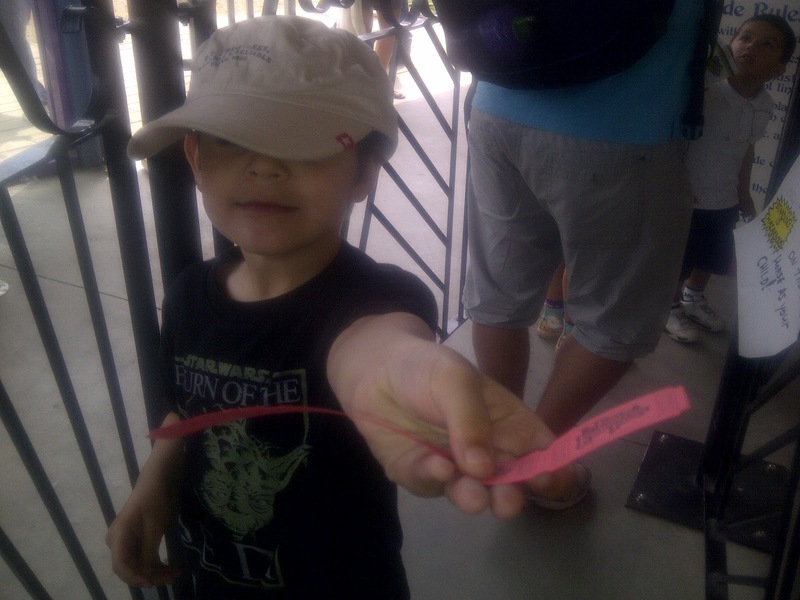 Do you have a favourite attraction that you think kids will enjoy. Add it here and we'll definitely explore it the next time we are here. Don't forget to eat in the Hotel Restaurant. Yummy food, and Ice Cream. We go several times a year now, it's like my second home, and a great place to just hang out. Love the old West, and seen the movie many times. Can't wait til next May to go back! Thanks for the recommendation. I always wondered if it was family friendly or fine dining. Glad to know that we can bring the kids.